Masud Khan (b. 1959) is a poet, writer, and translator who emerged as an important poet in the 1980’s, mostly supported by counter-cultural little magazines. Over the past two decades or more his poetry & essays have featured in magazines in Bangladesh, India, USA, UK, Belgium, & Canada. Sajjad Sharif writes about Masud - "the bifocal he wears partly artifies scientific outlook and partly the magical. A constant concertedness that arteries into and connects the sound & smell of nature and history, myth and modern reality, tying up the marginal with the whole, historical time and its loose ends, becomes the strongest descriptor of his work. The poetic language he uses is also multifarious - "tatsama" (sanskrit root) words are often paired up with vernacular or colonial English, a constant slippage of nouns and adjectives shining up old-fashined sentences. In the end, language sets up like trap a network of sound. A love for the epic form is another interesting character of Masud's verse - an epic, both short and prolonged, installed on the face of history & geography, producing in the end, a poetry of a timeless space that knows no political or cultural boundary." 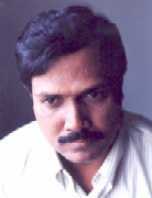 Masud Khan's poetry has appeared in a number of anthologies including Language for a New Century: Contemporary Poetry from the Middle East, Asia, and Beyond (Norton Anthology, New York/London), and Padma Megna Jamuna: Modern Poetry from Bangladesh by Foundation of SAARC Writers and Literature, New Delhi, India. He has, till date, authored three volumes of poetry: Pakhiteerthadiney (On the Day of Birds’ Pilgrimage), 1993; Nadikule Kari Bas (We Do Live by the Rivers), 2001 & Saraikhana O Harano Manush (The Inn and the Missing Men), 2006. He received the Bogra Lekhak Chakra (Bogra Writers’ Circle) Honour for Poetry in 1994. Presently a resident of Toronto, Canada, Masud Khan works as an electrical engineer. Where do I hold this image? And behind him, a snake spreading its hood. Of interlocking waves and smells of grass and Dettol her bed is made. In reeds and weeds of plastic and polythene! It seems, after a long time, dusk is wafting down on earth again. That has sprouted along the horizon cleft. The ship rushes on in dark, outrageous speed. The place where we used to live in childhood, there was a haunted house nearby, full of ancient trees and creepers and moss. One evening, starting up from his siesta and in the manner of a detective protagonist, my grandfather took me with him to that house. A forlorn place swaying in the breeze. From among a cluster of trees he pointed to me one. It was an ordinary tree with a few fruits hanging from it, which looked like grenades to me. It was the mewa. Custard-apple mewa. My grandfather said — These are fruits of paradise. The only heavenly fruit allowed to be exhibited on earth. Look at them closely and keep it quiet. No sooner had he said this than our bodies shuddered like fire-crackers. Engulfing me along with my thrills, my grandfather's pox-spotted fair body and dusk-colored long beard blew in the sporadic draft. Directionless, like a stray girl. A lone grave burning in scorching mid-day sun. “22 Paush 1382” the epitaph reads. With radiant blood and sharp intellect. The ignoramus explores the realm of the dead for relics. Caressing the tombstone, a calendar’s ashes blow away. Stupid man, those constructions are results of bad engineering. White and grey—compositions in white and white. Kissing the tombstone, a calendar’s ashes blow away. A man transformed into flint. Raw waters flow over its back. To the flow a glacier dips. By the bottom of a moonstruck ship. Such heft in acceleration and solution! It's so tenacious! The Tunnel is Death's second self. It's a hideout for missing men. All come home but one. And they tear away civilization's kaupin. For the missing ones under the sod? With fire and plague for fuel. From tomorrow, I'm a Tunnel-dweller. kaupin - Loincloth used by Indian mendicants.